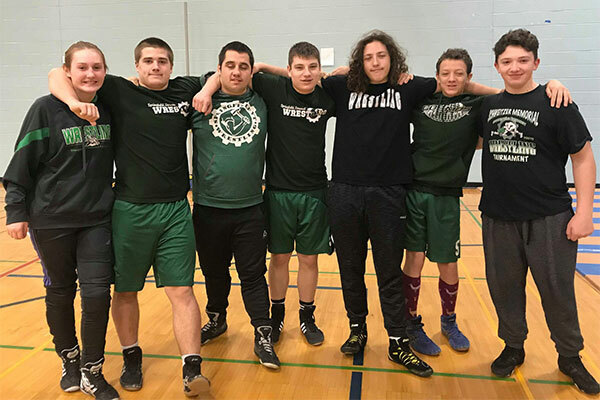 Seven members of the Springfield, VT's varsity wrestling team battled it out for the two-day Michael Baker Classic tournament in Essex on January 18th and 19th. Coach Don Beebe was very pleased with the efforts put forth by every grappler. Skyler Congdon, Tim Amsden, Bryan Stafford, Jeremy Curfman, Brandon Bennett, and Skylar Wallace each performed at the top of their game with skill, strength, and great attitudes. Many of their arms were raised in victory over the course of the tournament. Sophomore Donavin Sprano, in his first year of wrestling, took his work to the next level against all his opponents in the 220-pound weight class. Sprano's final match was a true nail-biter, as the sophomore battled a larger opponent who has experience competing at the national level. After a couple of close calls, Sprano resisted a powerful throw to off-balance his opponent and reverse the match, claiming the top spot on the podium with a beautiful pin by headlock. The "Green Machine" continues to drill every weeknight and has competitions scheduled every Saturday for the next month, until the end of the JH & HS season. For more information on the team, visit the Facebook page (which covers Springfield's entire K-12 team) at www.facebook.com/SpfldVTWrestling/. Team photo by Cathy Bennett: L-R: Wrestlers Skyler Congdon, Donavin Sprano, Skylar Wallace, Jeremy Curfman, Brandon Bennett, Tim Amsden, Bryan Stafford.